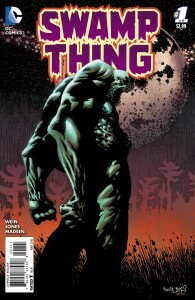 For those of you who are big Swamp Thing fans, this book is a return to what you want from your Swamp Thing. 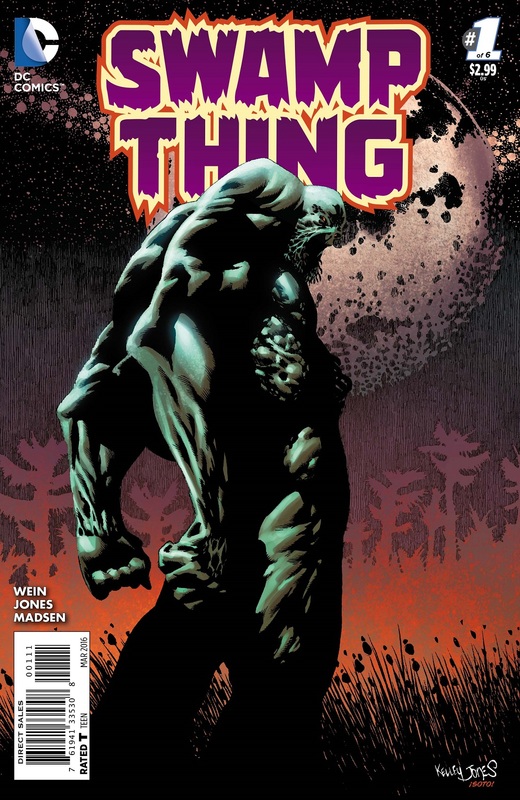 Written by creator Len Wein, who picks up aspects of the Alan Moore run on the book, Swamp Thing is reintroduced as a Green Elemental with the personality of the man he once was. 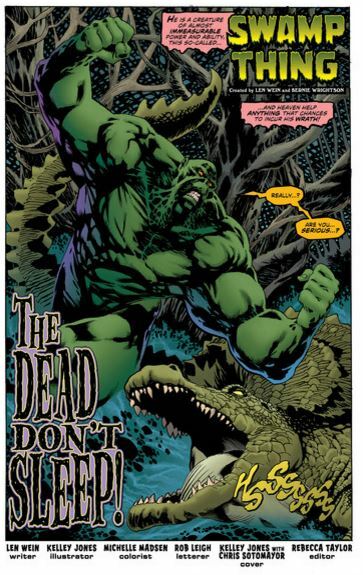 Wein doesn’t delve into the origin, just establishes what Swamp Thing is through a mundane battle with an aligator and a visit from the Phantom Stranger. 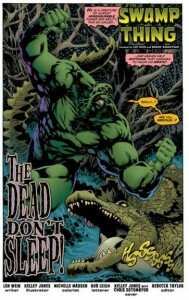 The first story arc is set up with the appearance of a couple in his bayou in search of Swamp Thing. Their son has gone missing, and they believe supernatural forces are responsible. Having Wein write Swamp Thing is like putting on your favorite, broken-in shoes. They don’t have the bounce of something new, but the feel good and you can wear them all day. Wein sinks you right back into the bayou and makes it a place where odd things live side-by-side with bullfrogs and gnats. This story could take place anywhere in time, but in an ageless and not at all dated way. He took the best of what other authors did with his creation and wove it all into a seamless, timeless whole. If Wein’s writing gives you that classic feel, Kelley Jones puts a classic touch on the art. Short of getting Bernie Wrightson to pen this issue, Jones does a perfectly servicable job of bringing a pardigmatic monster to the page. This is really a fantastic fit, as creepy monsterous hulks are what he does best. Madsen’s muted colors give you that dank, swampy feel that you want from a story like this. With a start like this, I think it will be a great mini. Wein and Jones have conspired to make what I hope will be one of those Swamp Thing stories we’ll venerate. Loved the art on the book. Thought the story kind of stuttered. I am giving it the benefit of the doubt that it is because it is a first issue… Trying to introduce and start up is never easy… Going to give it a couple issues just because I love the character and creative team they have on the book. That’s really interesting, since I have a few friends who are really HUGE Swamp Thing fans, and they are really excited about the writing but not so much for the art. Somewhere for the two groups there is a happy medium. I just had issues with the zombie, as he was patently un-zombielike. We shall see…..